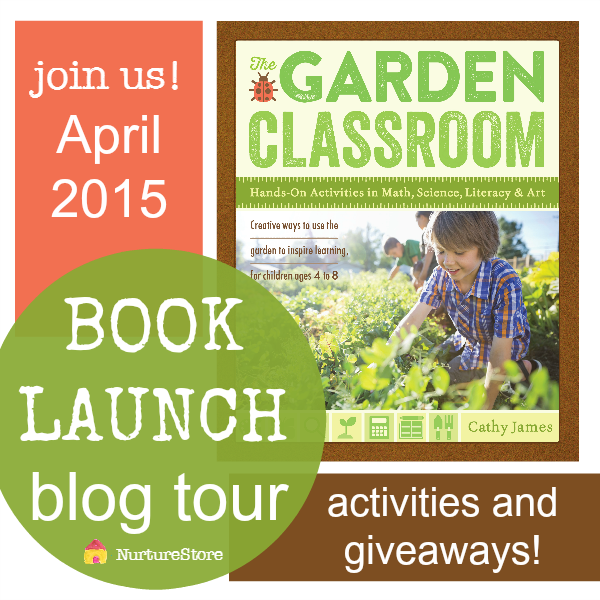 I am beyond thrilled to be participating in the book tour for my friend Cathy's new book, The Garden Classroom. I have a complete and utter black thumb when it comes to gardening and making things grow... or even just keeping them alive. My goal for this Spring is to turn over a new leaf and learn a bit about gardening and share what I learn with my kids! I am so excited to have Cathy guiding me along through her book. Today I'm going to share a little bit about The Garden Classroom book with you and I'm also going to share one of the activities that we tried from Cathy's book (a Tin Can Hair Salon), with a few modifications. 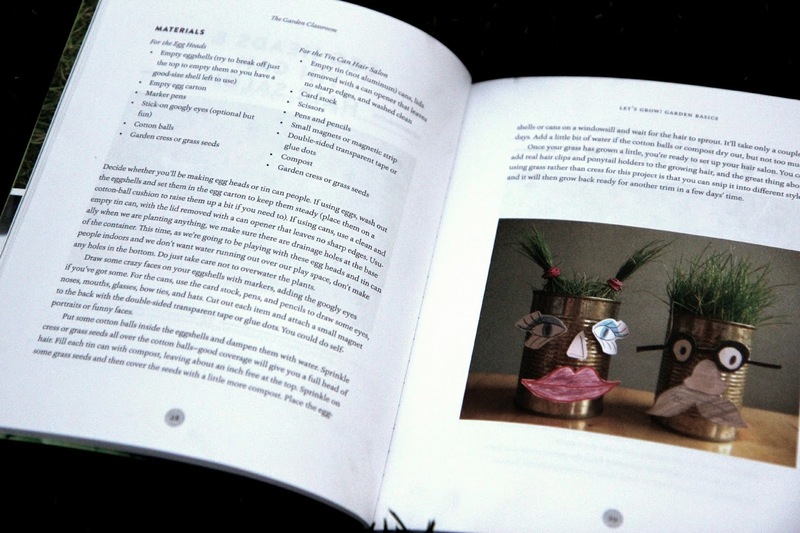 The Garden Classoom is a book that shares creative hands-on ways to use the garden to inspire learning. The book is for kids ages 4 to 8 but we are having fun adapting some of the activities for my toddler as well! An introduction that shares how to nurture young gardeners. The section includes what to grow, how to set up your garden classroom, and garden volcabulary. If you want your own sneak peek inside The Garden Classroom, just click around on the image below. We've been having so much fun looking through Cathy's book and plotting which activities we want to try. My kids are planning a fairy garden right now and also want to build our own garden fort. Our favorite activity in The Garden Classroom is the Tin Can Hair Salon. To make a tin can hair salon you grow grass in a tin can and then decorate the outside of the can with little faces stuck on using magnets. 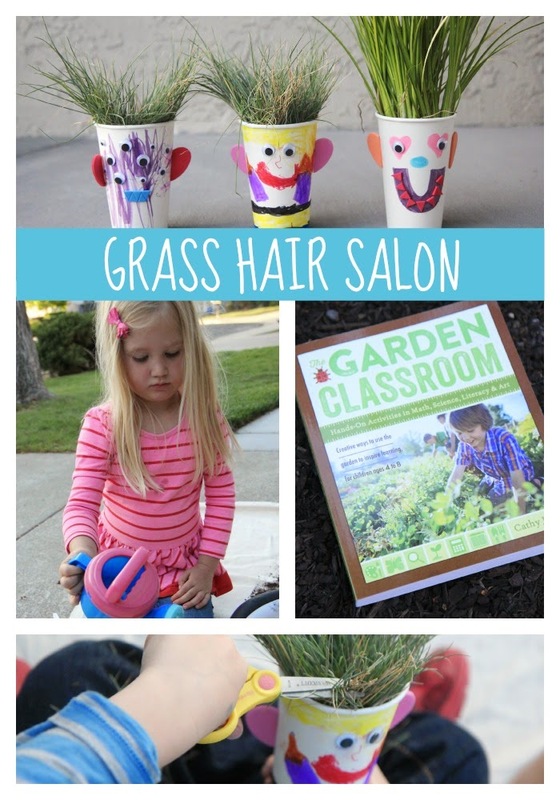 Once the grass is grown and the can faces are designed you can have your own hair salon! 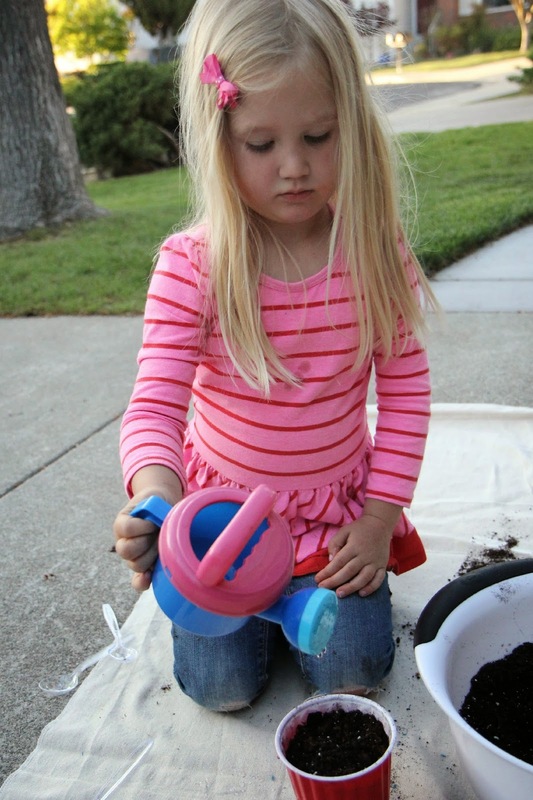 This activity is such a fun first time growing activity for kids. To modify this activity a bit for my toddler we decided to grow our grass in plastic cups and then stick the plastic cups inside decorated paper cups. Instead of using magnets to stick on our faces we just used tape and glue and also decorated the paper cups with markers. Easy peasy! Here are a few photos of our planting, decorating, and grass hair salon experience! The kids had a blast scooping dirt into their cups prior to planting the grass seed. I put everything on top of a painter's tarp to help contain the mess a bit. Then I let them scoop in some grass seed and spread it around and bury it in a little more potting soil. I actually think we put way too many grass seeds into each cup... so some of the seeds never grew... but we still had TONS of grass! The final step was watering! This is always tricky with little ones since you don't want them to flood the plants and kill them at the very beginning! I let the kids water a little bit using the watering cans (cheap ones we bought at Target last summer) and then I also had them use a spray bottle since that helps limit the amount they spray. We planted our grass several weeks prior to planning our grass hair salon. The kids had so much fun waiting... and waiting... and waiting for our grass to emerge. I actually didn't think it would. Neither did my husband. I actually went to the store and bought grass that was already grown as a back up just in case our grass didn't grow... that way we could still do this activity... since the kids were SO EXCITED about it. (Note: the tallest grass in the photos above is from the store :)). I kept plugging along and the kids and I watered it daily with a spray bottle (not too much, and not too little). Fortunately, OUR GRASS GREW!!! I haven't been this excited about anything in a long time. It took more than a full week for the grass to start to emerge and then it just kept growing! After a few weeks it was long. Once our grass got pretty high (and was starting to wilt a bit), we decided to get moving and make our Grass Hair Salon! 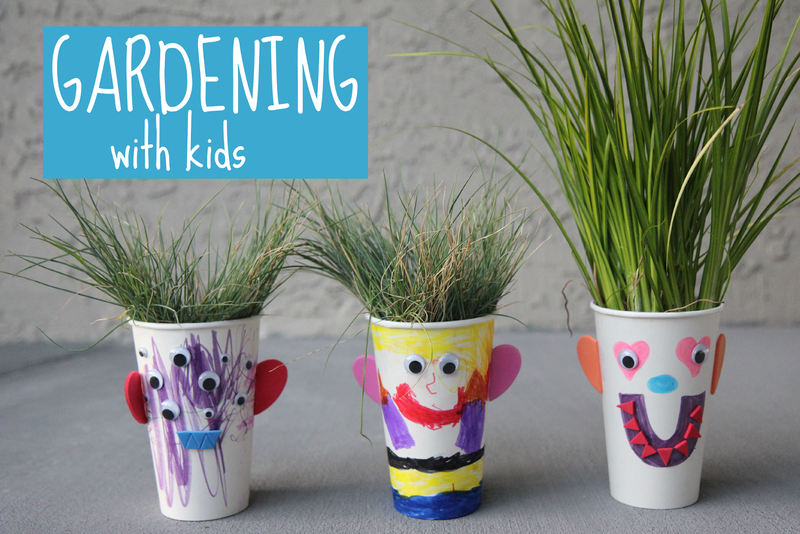 The kiddos decorated their cups and then we added the plastic cup filled with grass inside and then they were ready to begin grooming their crazy grass friends! We had ribbons, hair clips, hair ties, etc. and the kids played around with those a little. Their favorite thing to do was give the grass a hair trim. Once the kids were done cutting we set the grass aside to water. Hopefully we'll have time for another Grass Hair Salon later this week. It was so fun! If you are interested in gardening with kids you can co check out The Garden Classroom book tour over on NurtureStore to learn more about this awesome book and see a few other featured activities. You can also grab your own copy of The Garden Classroom! You'll be able to get an introduction to gardening and enjoy an entire year of outdoor play and learning ideas for kids! From The Garden Classroom by Cathy James, © 2015 by Cathy James. Reprinted by arrangement with Roost Books, an imprint of Shambhala Publications Inc., Boston, MA. www.roostbooks.com. Disclosure: I received a free copy of The Garden Classroom from my friend Cathy to read and share with our Toddler Approved community. All opinions shared are my own. Excellent presentation...I'm excited to get Cathy's book, The Garden Classroom...my three great grand children will my first students.Thank you for inspiring me.